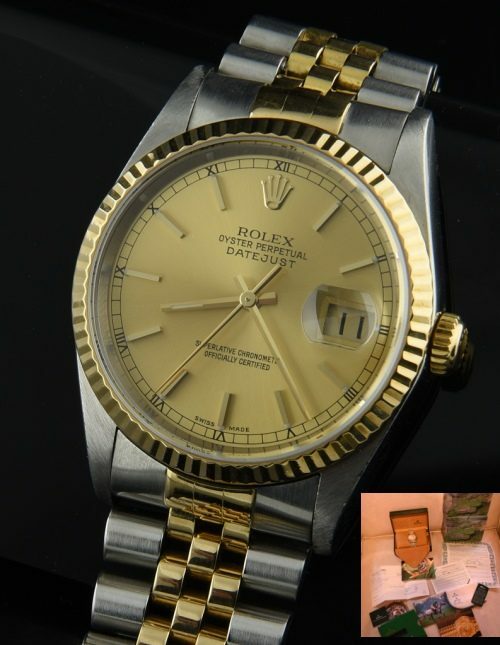 This is an “P” series (sold in 2000) Rolex Datejust 16233 measuring 36mm. with full length 18k. and steel original Jubilee style bracelet which has minor stretch and looks fabulous! The steel case with 18k. bezel glistens. This fine automatic winding movement was just cleaned by our ROLEX trained watchmaker in March 2018. The box, papers and even past cleaning receipt is included. The gold dial is pristine. This is a complete package Datejust two-tone, fully serviced… looks close to new-at a GREAT price!